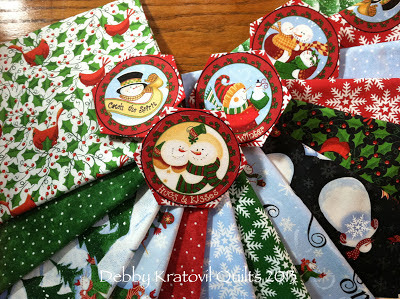 Today is the first day of the Ho Ho Ho Blog Hop. 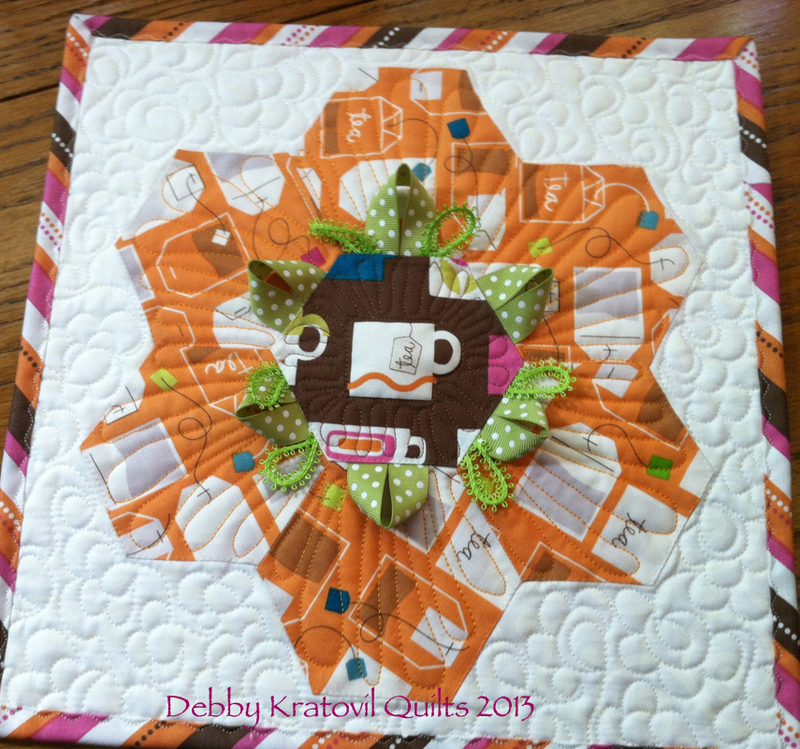 I wanted to make sure that my followers got to see all of the fabulous creations made by today's Hop bloggers. 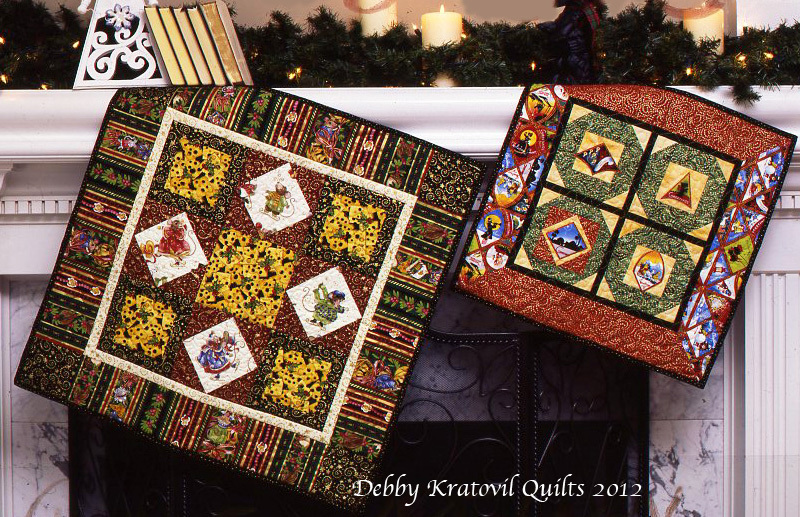 I will be posting a quilt or two from my own Christmas vault each day. I hope you take a few minutes to visit these folks. Enjoy the ride. Come back tomorrow to see a new list - and a new quilt from my Christmas vault! And be sure to see what I will have on Tuesday, August 6. Please Don't Pick on My Strawberries! Did he really have to count them? 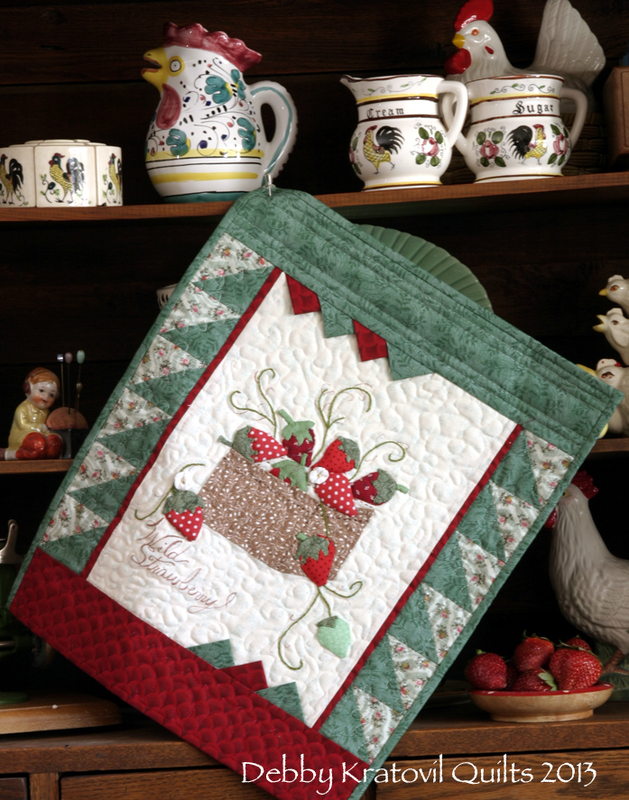 Imagine my horror after dinner the other night as I watched my dear husband Phil walk into the hallway, stop in front of this mini quilt and begin counting the strawberries by POKING EACH ONE WITH HIS FINGER! Poke - one; poke - two, up to 8 plump strawberries. I gasped: "What are you doing? 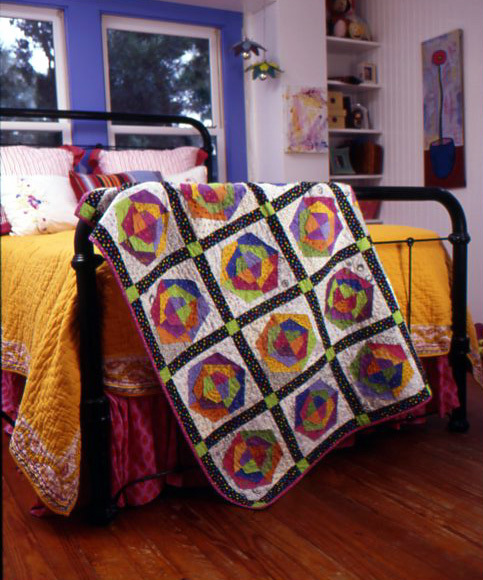 You're not supposed to TOUCH quilts. You KNOW that, right?" He looked chagrined - and grinned like a Cheshire cat (or like a junior high boy caught in the act). He IS a keeper and like I always say: I'm still married to my first husband after 36+ years. Never found anyone better. 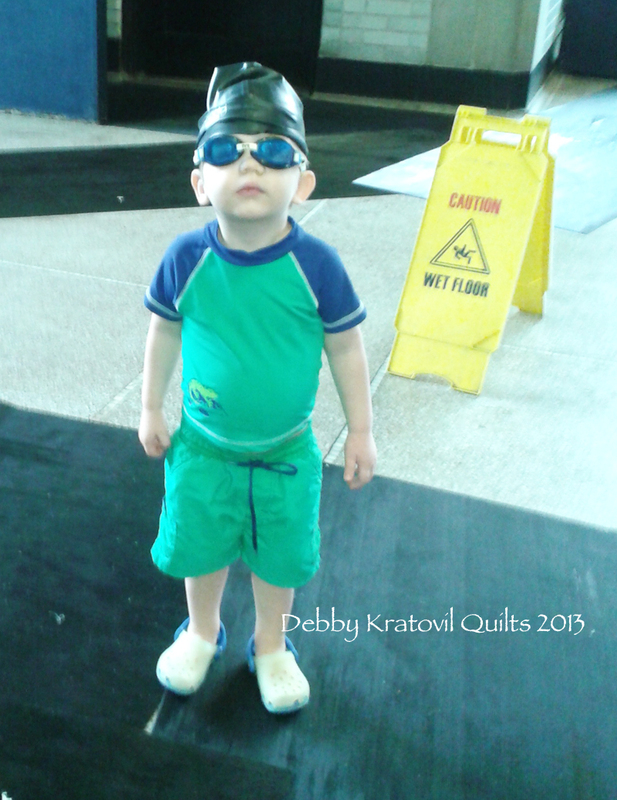 But where did I go wrong about teaching him how to treat quilts? It was the lure, I guess, of those plump strawberries. His own strawberry garden didn't yield any this first year, so maybe he was just getting out his frustrations. 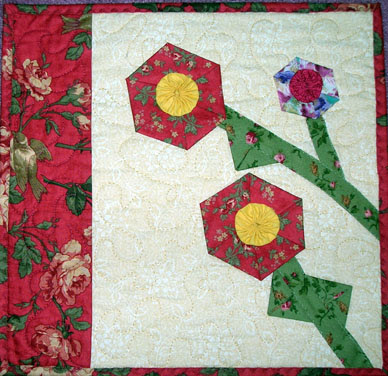 I found my pattern for this quilt which appeared in Applique Quilts in 2004. 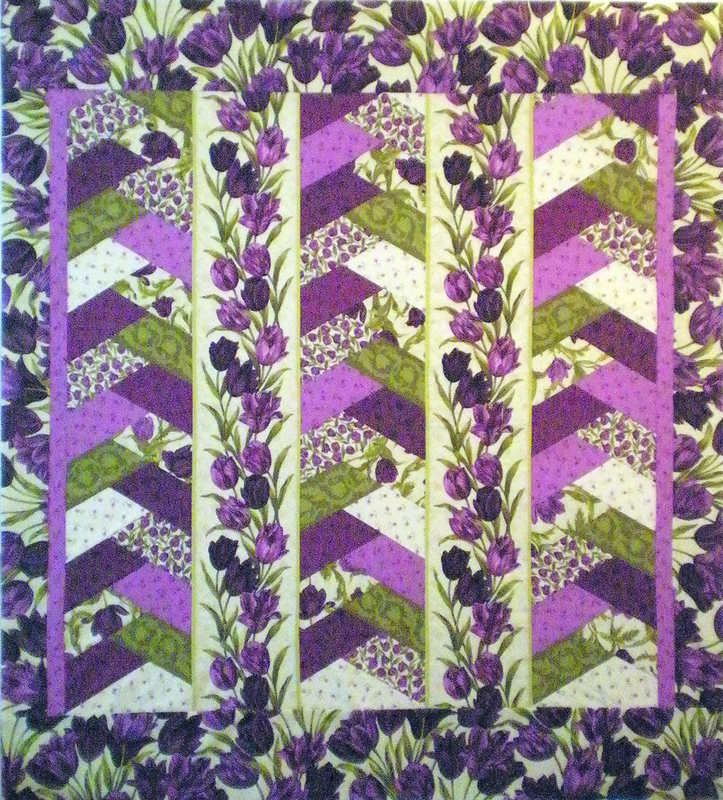 I didn't make the center block (it was an orphan I came upon), but I did design and execute the layout and quilted it. 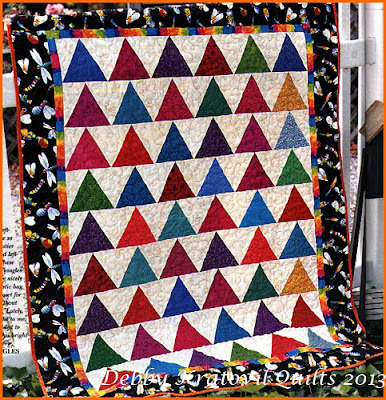 I love the asymmetry of the borders and prairie points, don't you? 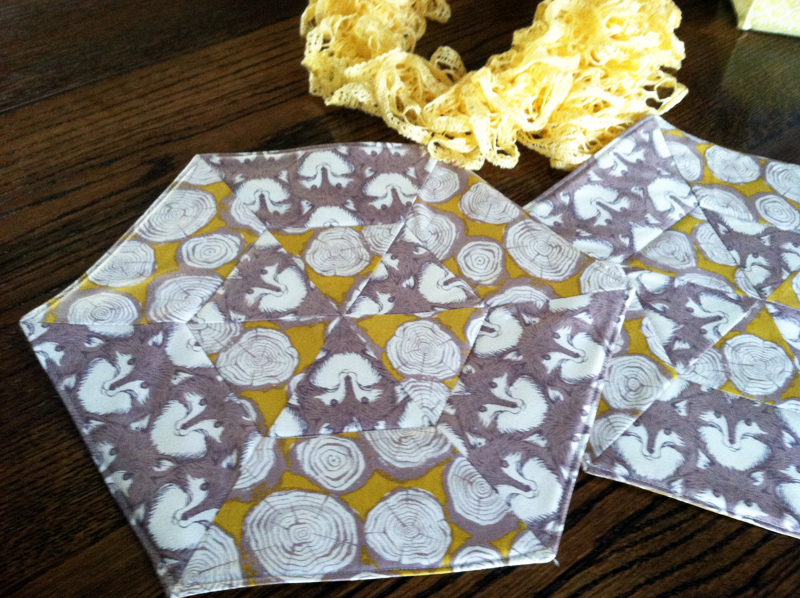 You can have this pattern FREE, yes I said FREE. 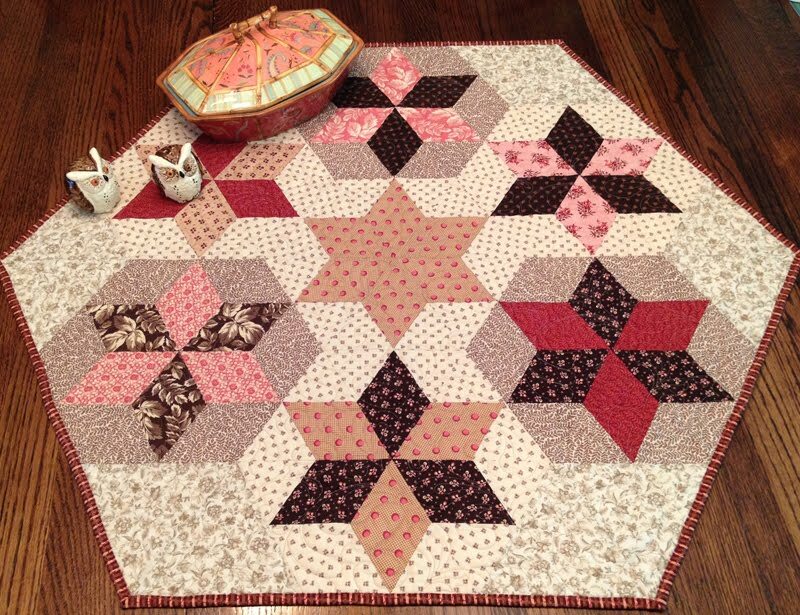 Simply visit my Craftsy store and look for it at the top of the list. The link for my Craftsy pattern store is on the right sidebar. 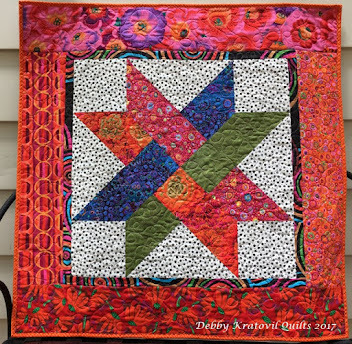 Thanks so much for your continued interest in my patterns and stories about my quilts. They each have a unique tale. This one about my husband poking all 8 of those strawberries is one of the craziest! 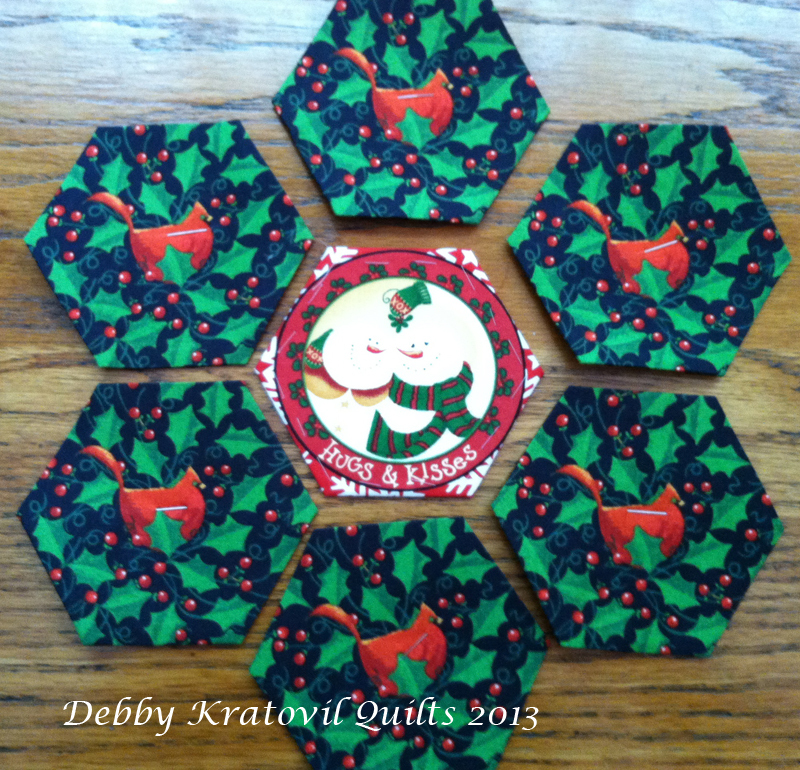 Direct link: Christmas in July, quilt and tutorial! 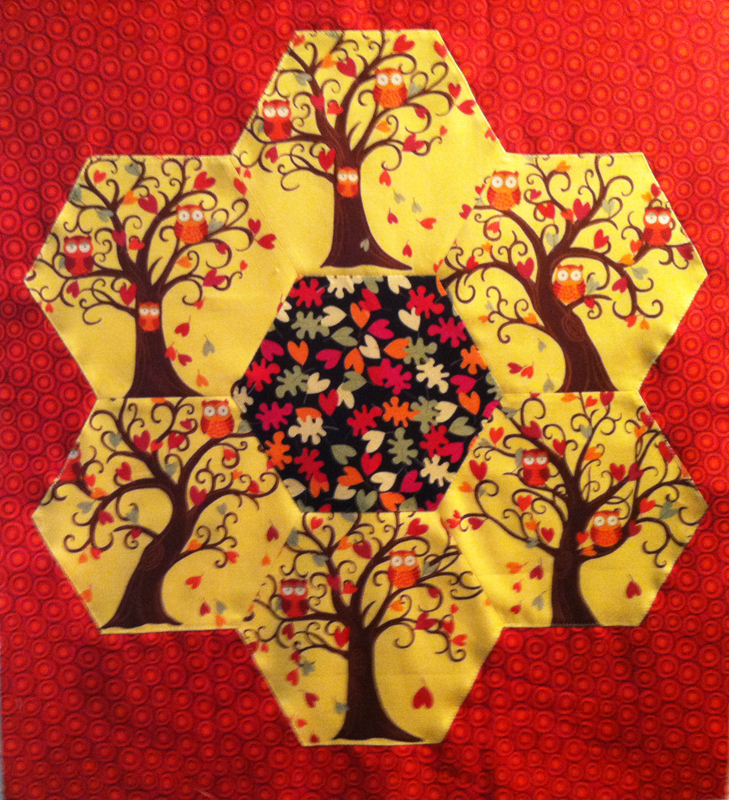 Today I am featured on the Benartex blog - Sew in Love with Fabric - and I share a tutorial for making that awesome Twisted Hexagon block using this holiday collection. 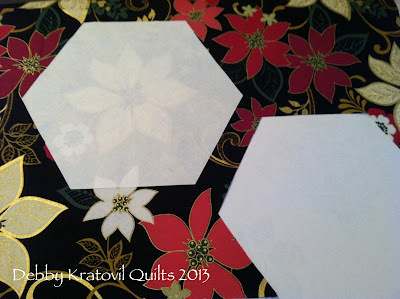 As you can see in the picture above, I am fussy cutting hexagons using freezer paper to isolate the motif I want. 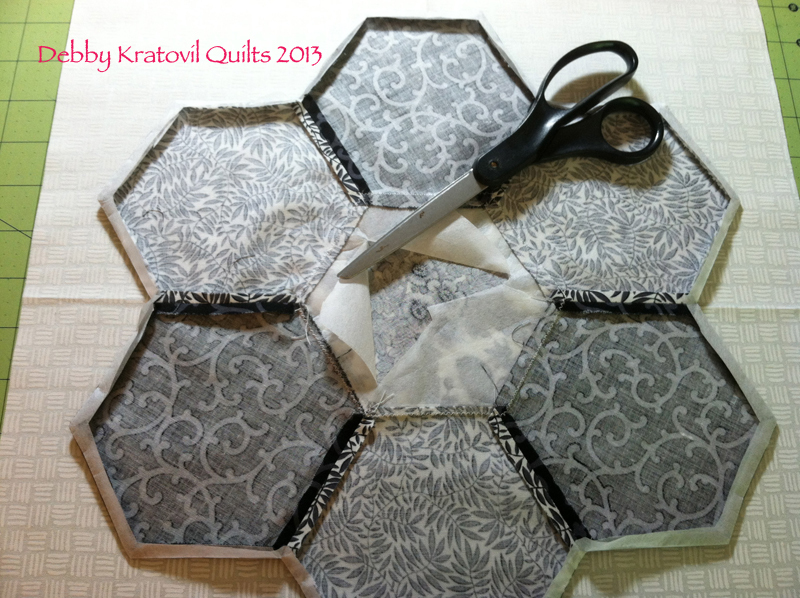 You can see how I make that Twisted Hexagon block using these hexagons and also half-hexagons. 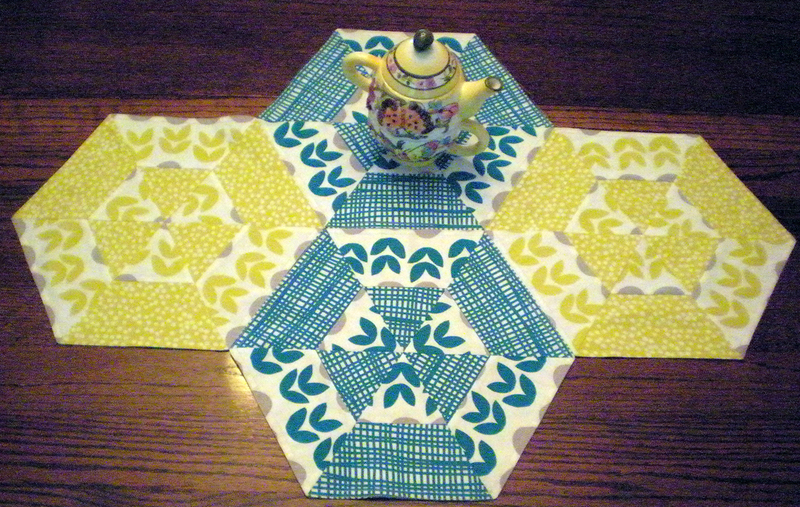 I square up the hexagons (well, not actually squares, more like rectangles) and then combine them to make a beautiful table runner. I talk about where I get my ideas, whether I make "mistakes" (yes, of course I do!) and my process for sewing. Take a visit because there are prizes EVERY DAY! I am one of five designers who are featured and so you have several chances to win. I've also been asked to share a favorite cookie recipe. My 3 daughters are grown, but they still ask for the same cookies when they come home for Christmas. So, beat the heat with our Christmas Spectacular, Twisted Hexagons and other yummy things to take our minds off this summer heat! Come back here to leave a comment to enter to win some of these awesome fabrics! The Lion Sleeps Tonight - But What About the Elephant? 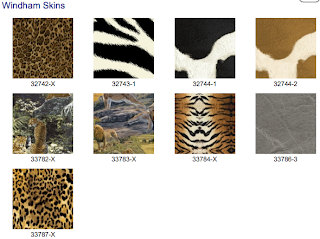 No, those are not wrinkles in the fabric - just the elephant hide! I lived in Africa for 3 years and I have wonderful memories. I met and married my Texan husband there and we visited a few game parks where we saw elephants, lions, cheetah, zebras, and many other dangerous animals. 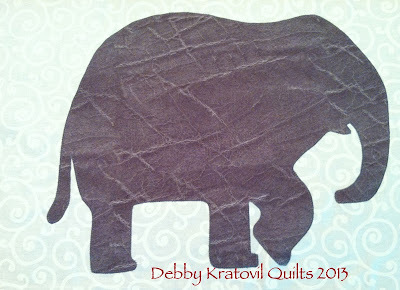 I designed this elephant appliqué several years ago for a Windham fabric collection and still had the freezer paper template. I dug it out, asked for a small piece of the elephant hide fabric and stitched this yesterday. 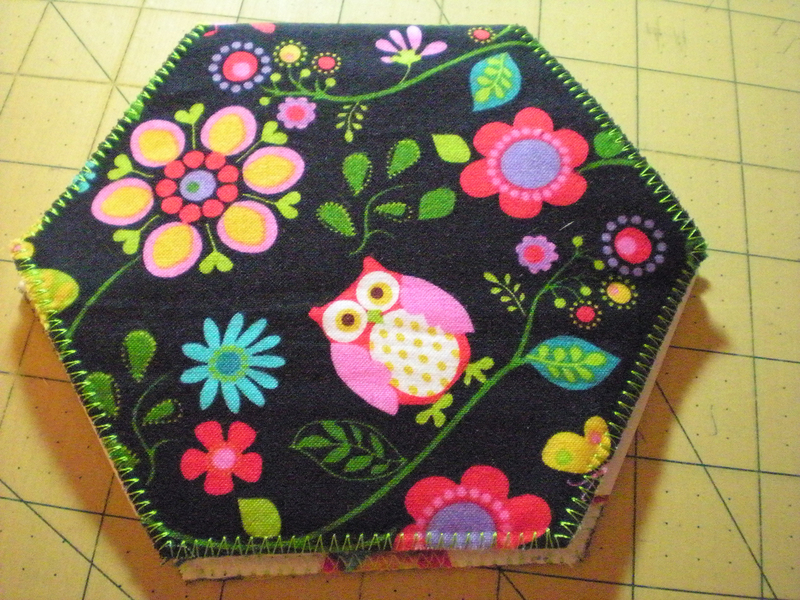 (You can have this applique; more later). 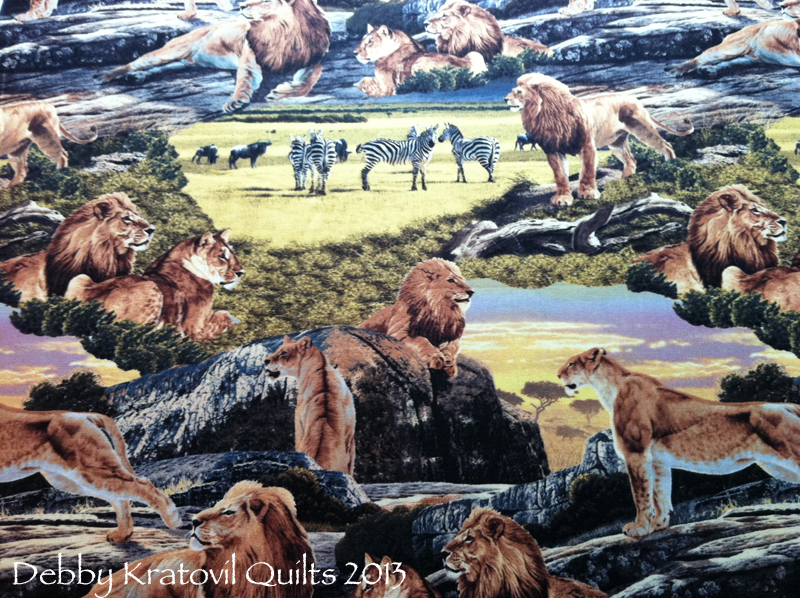 Can you believe all these wild animals? The colors are so vivid in this fabric! I plan on making an elephant pillow or small quilt with other animal motifs for my grandsons. But I wanted to do that one applique. 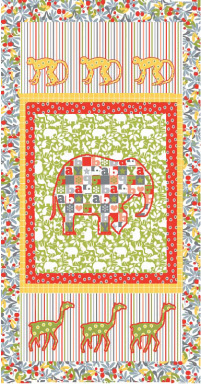 I have to say that my memory of this elephant (and the monkey and giraffe) was triggered by the current issue of Stitch magazine (one of my absolute favorites!). There is an elephant applique pillow (my applique predates theirs by about 5 years) and some wonderful wild animal motifs. Take a look at the other skin prints (I didn't say skin FLINTS) that Windham has. I think they're awesome. Hope you enjoyed your African Safari visit today! Now for some 60 degree triangles. 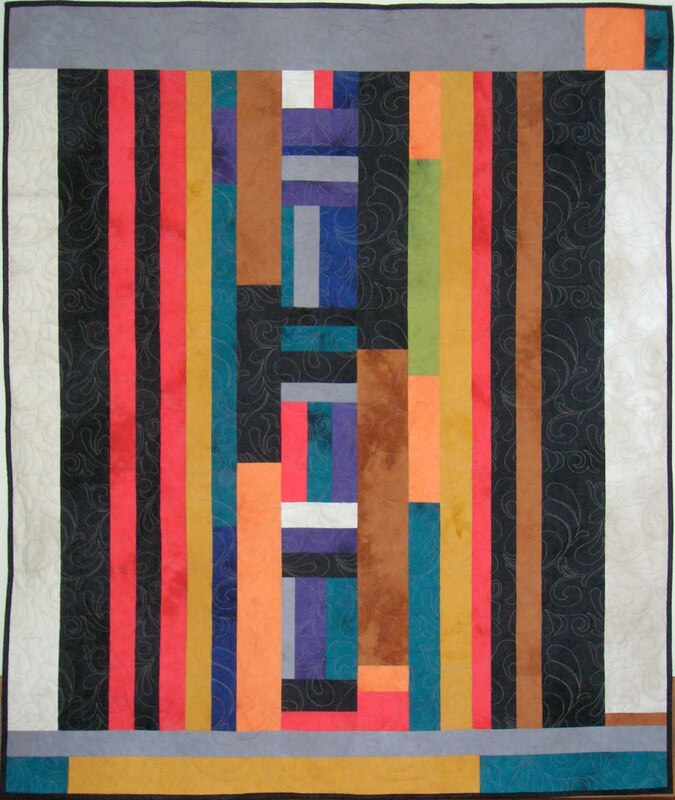 This is another OLD quilt that has gone on to stay with some young child. 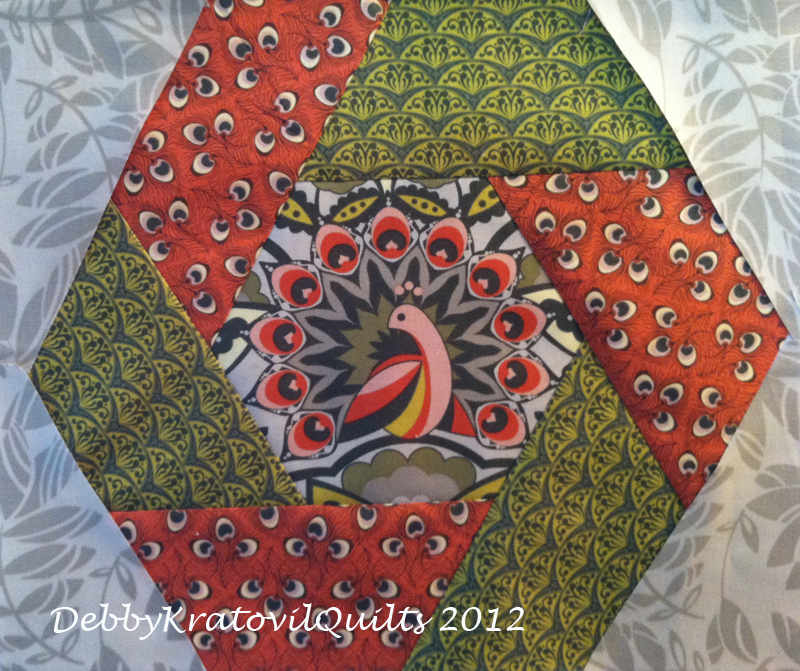 I have made this pattern many times using a 60 degree triangle template. OK. Stop looking at the cute bunny! 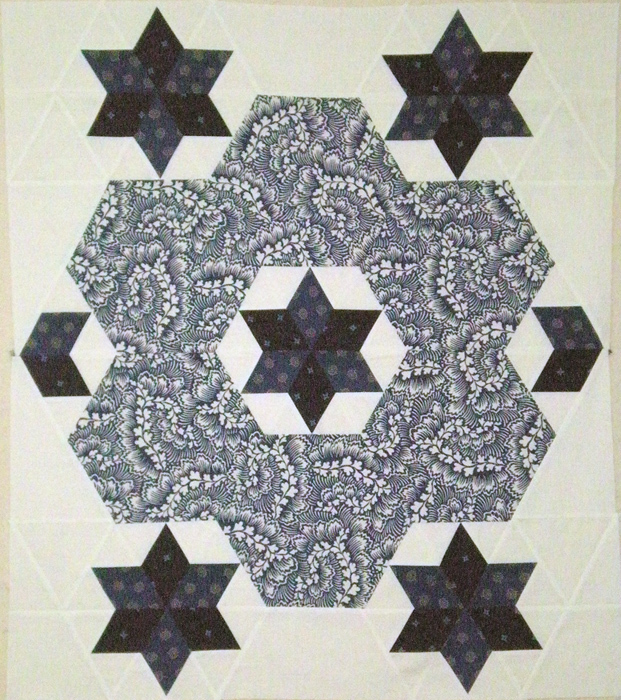 Can you see all those hexagons? 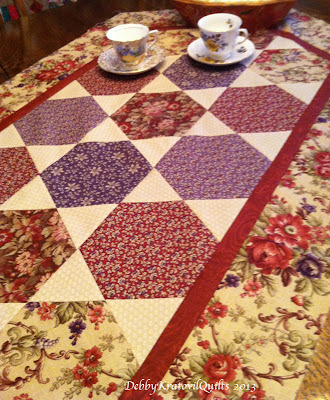 I was given some leftover Grandmother's Flower Garden blocks and I made a few placemats with them. 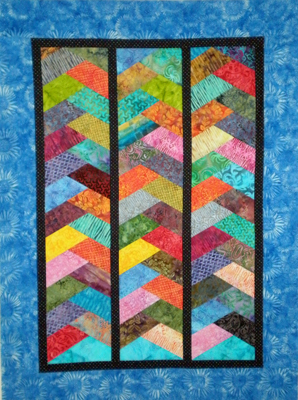 Just appliqued them to a background and added some simple squares and pieced strips to make them into rectangles. I have a green one and a burgundy one. Wonder where they are? 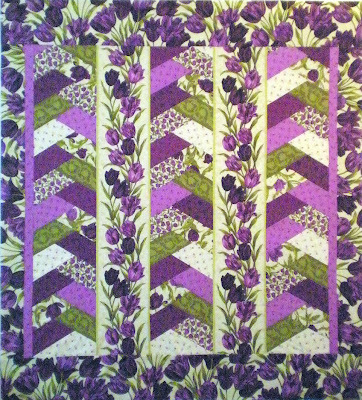 One last quilt using my stacking squares. This is sort of like Bethany Reynolds' Stack 'n Whack, but much easier. I featured this on my Halloween Quilt back in October. 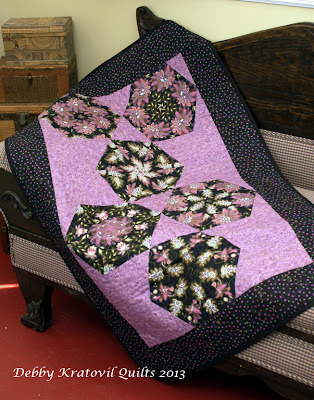 This purple quilt was my first attempt and I still own it. OK. Hope you had enough hex for one day. 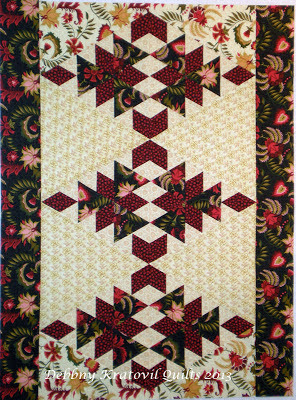 I'll feature a few more quilts as a buildup for the Hexie Queen Blog Hop which will begin on August 20th (we've added an extra day). We have over 75 bloggers who are so excited to share their hexie projects. You must come back and see us for that! It's true. 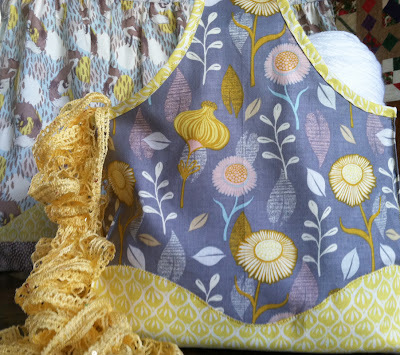 I didn't say it was easy, but when your oldest favorite daughter falls in love with a new fabric collection you have, insists that you buy another 3 yards and then buys a $17 dress pattern, you're in! 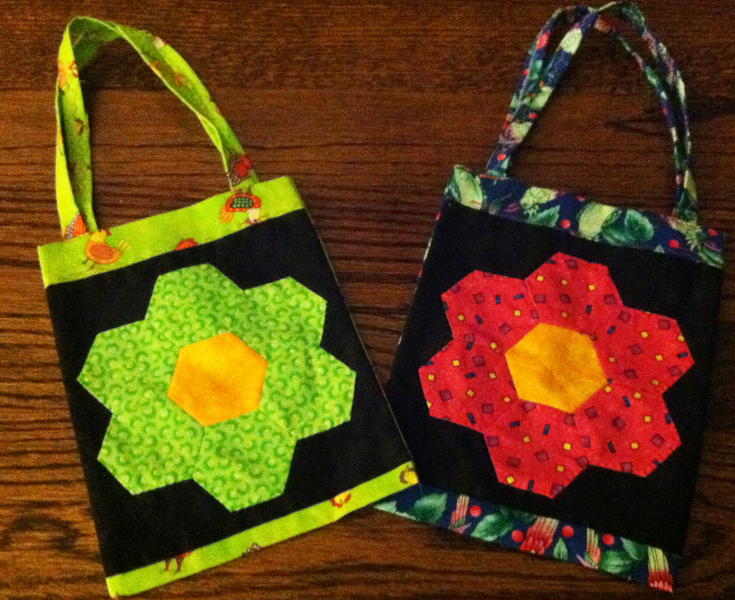 Yes, hexagons. Who can resist? 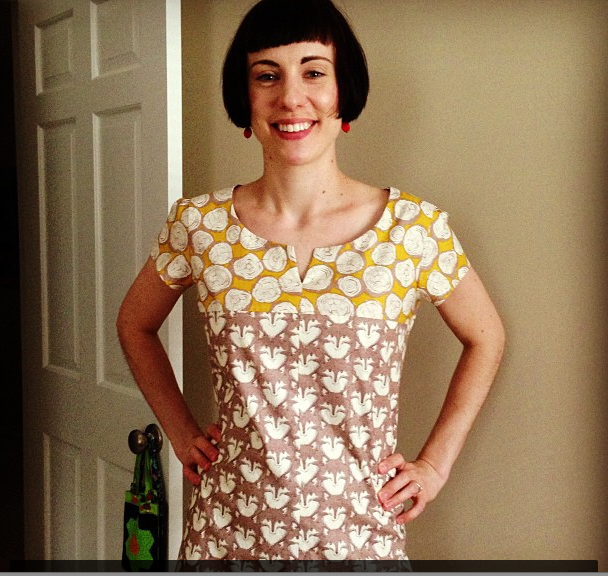 I hadn't made a dress in probably 20 years. We even put in a 20" zipper and faced the neckline. I still can't get over that $17 pattern price. 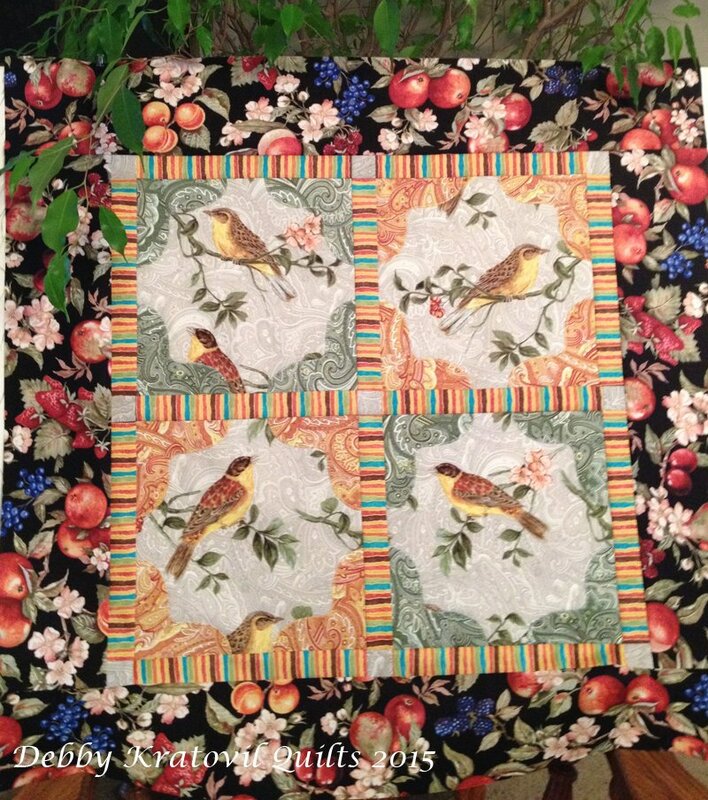 When I began sewing, patterns were still under one dollar (I never claimed to be a spring chicken). And Audrey's take on the whole day's experience? She loves her mother and she loves her new dress. Life is good. Oh, and the icing on the cake? She's going to give me my 3rd grandchild in 6 months, hence, we kept the darts out of the dress and bumped it up a few sizes. 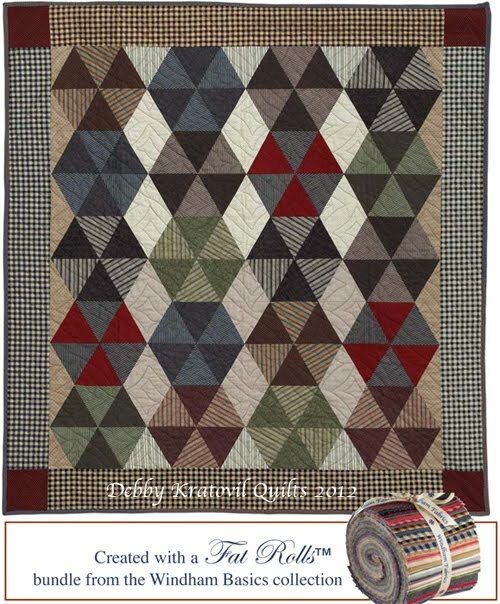 The new "Let It Snow" collection by Windham Fabrics combined with a renewed interest in GFG blocks: English Paper Piecing with sturdy (card stock) papers wrapped with fabric. Makes for sharp points and uniform sizes of hexagons. 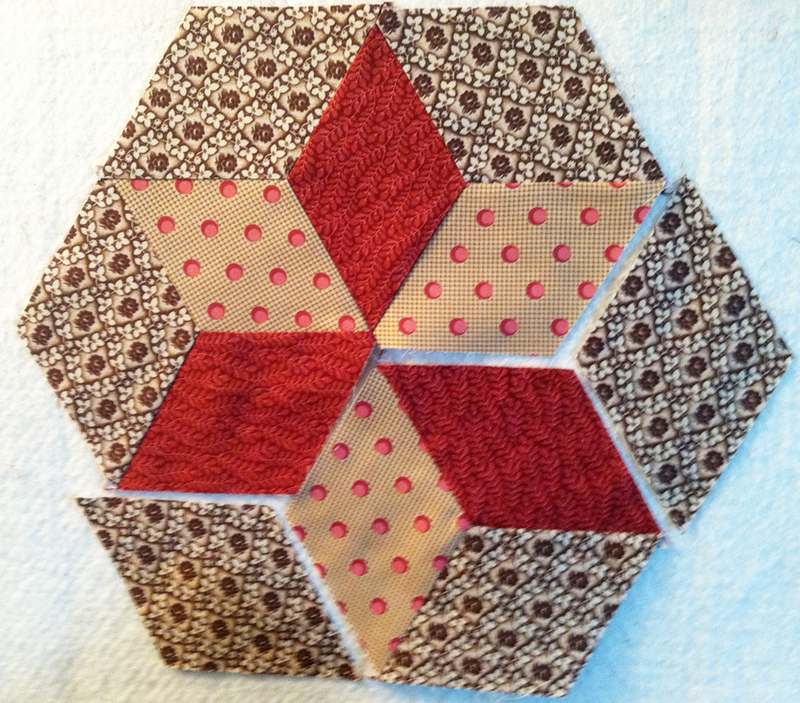 Did I say hexagons? 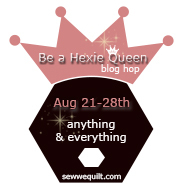 Isn't there Hexie Queen Blog Hop coming up? ARE YOU INTERESTED? SIGN UP NOW! Where I live it's hot, swampy and hot (did I already say "hot"?). But there's always room for the holidays and visions of snow. 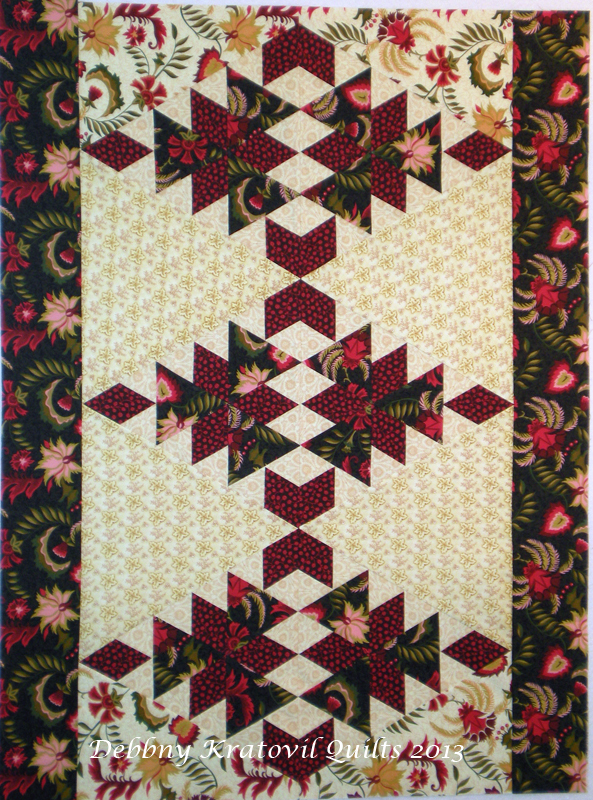 Windham has a whimsical collection called "Let it Snow" and I am making several blocks using the EPP method. 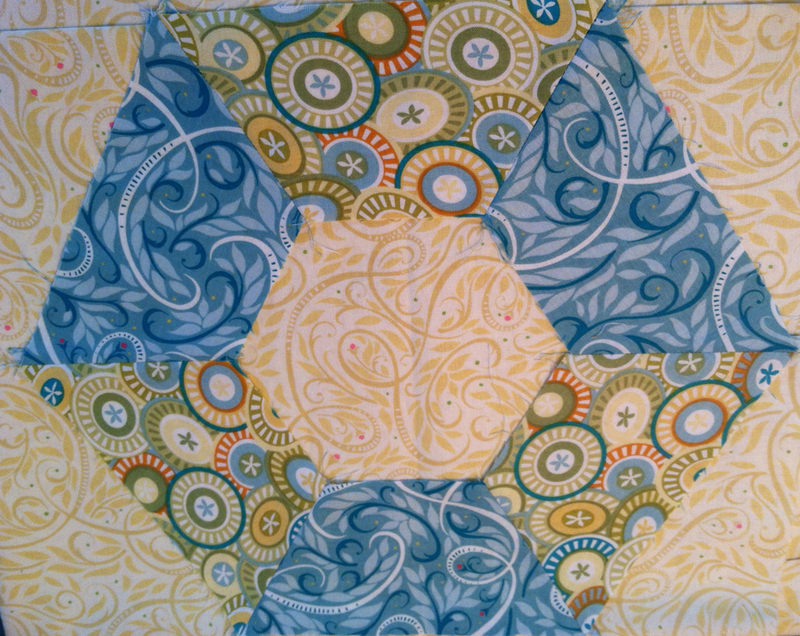 You can see the centers of 4 blocks already formed in the picture above. 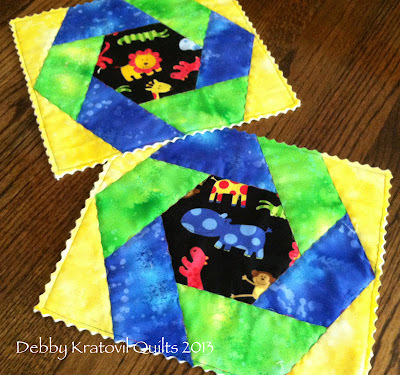 I have two blocks on their way to completion. 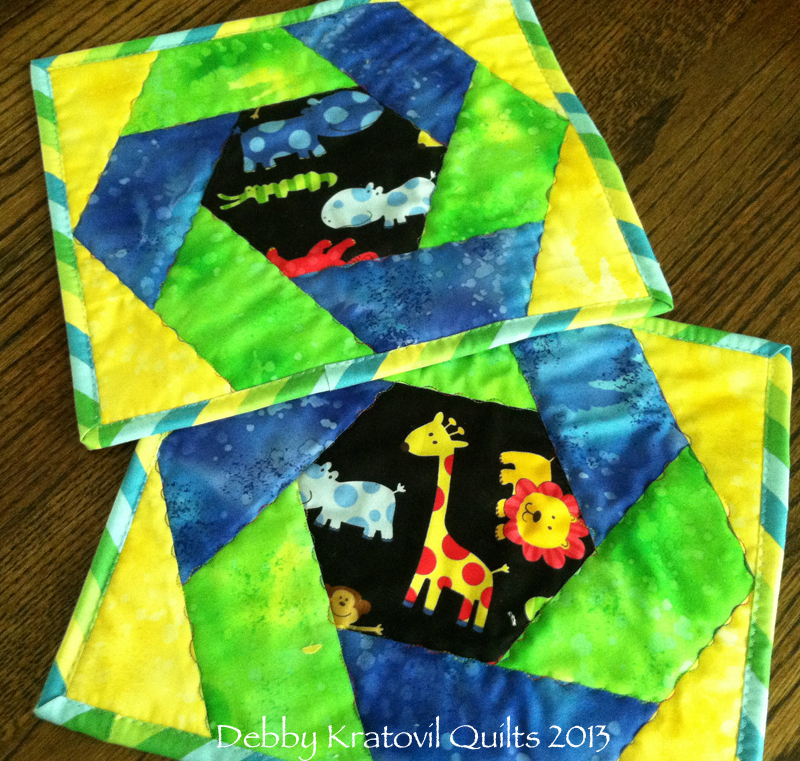 Very fun and easy take-along hand sewing. 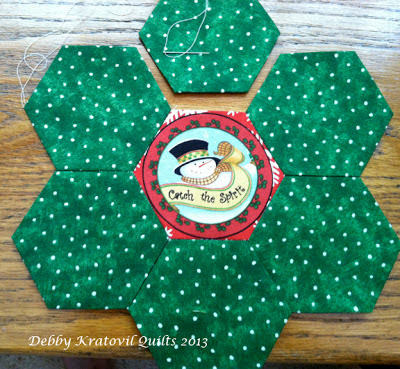 Throughout the month of July I will be featuring more hexagons and the Joys of Hex (don't go there; I didn't say that other word). And I am trying to feature Christmas and Hannukah fabrics. 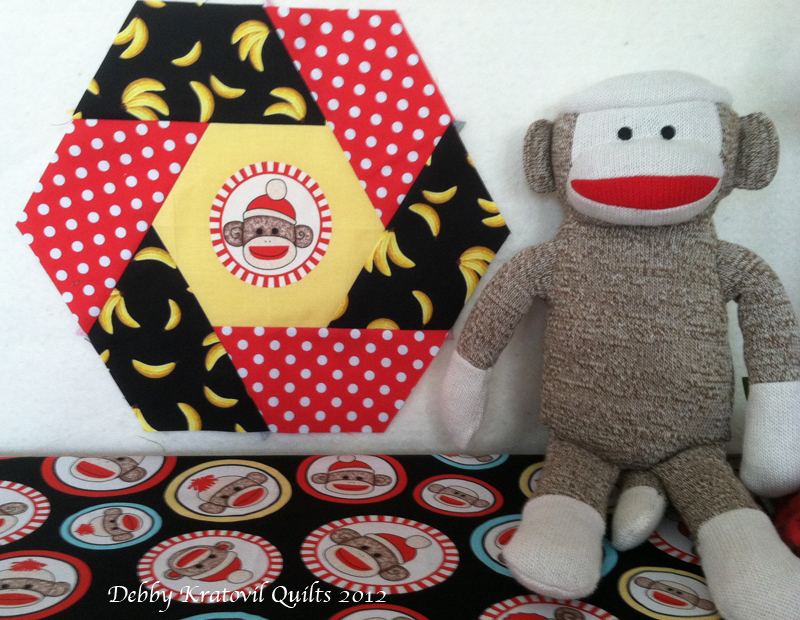 I have been asked to be the Cheerleader for this Queen of Hexie Blog Hop and I am taking that seriously. This hop will go from August 21 - 28 and you will be treated to an amazing array of creative projects. Please make sure you are connected and informed. I am so excited and I know you will be so inspired! I'll keep you posted. Until then, May the Snowman Be With You! 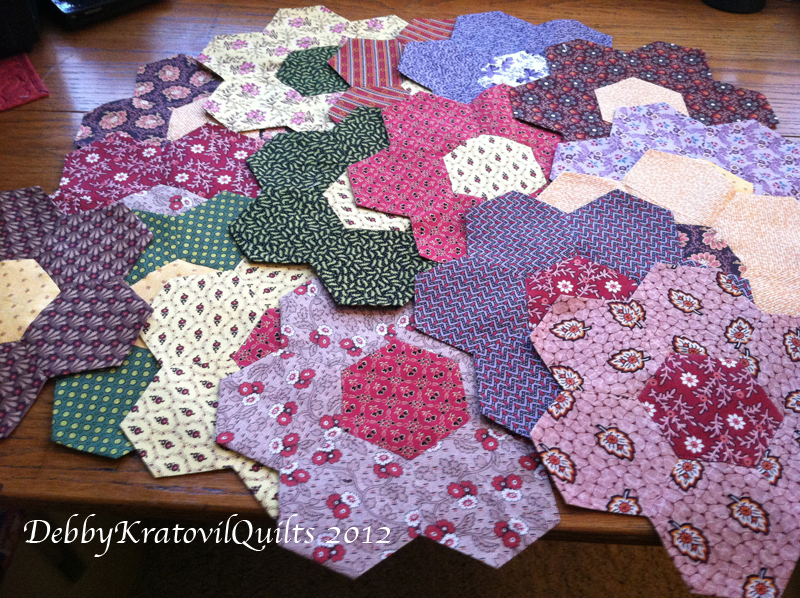 The Hexies Are Coming! The Hexies Are Coming! You will begin at the Sew We Quilt web site, where all great blog hops start! Nothing to be worried about! 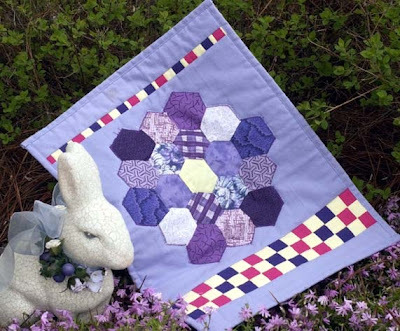 Hexies are fun and can make your quilt life an awesome adventure. Stay tuned for a BIG announcement this week. I have some inside information that this is going to be a very creative HOP. I have been very busy rummaging through my closets and computer files for 20 years worth of 60 degree creations and boy! do I have a LOT of quilts. Maybe that's due to my history of being a math teacher in a former life. What to give my favorite oldest grandson? Place mats! 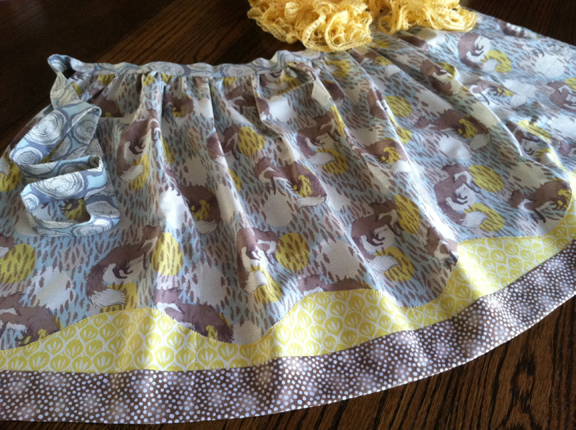 Yes, that is ribbon and stuff peeking out of those seams! 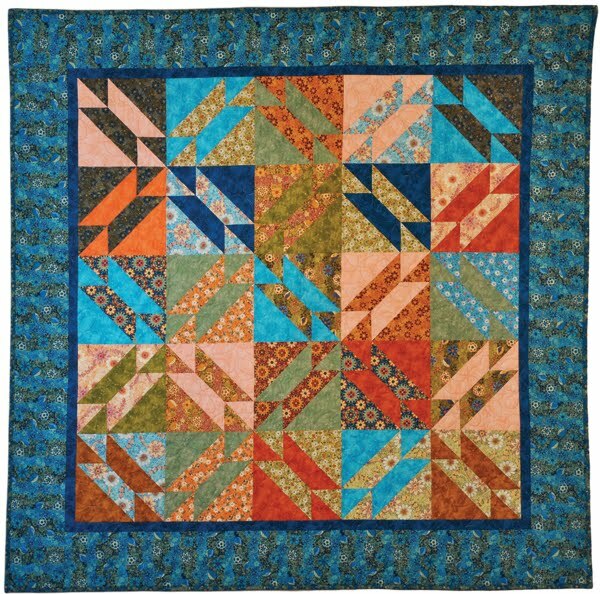 Not a single stitch by hand! OK. It's appliqued. Now what? No templates, no set-ins, no sweat, no kidding. FREE pattern for this - click here! One of my most popular classes. Serendipitious that these motifs fit my template! Not every 60 degree shape is a hexagon! Ooodles of GFG blocks - by machine! 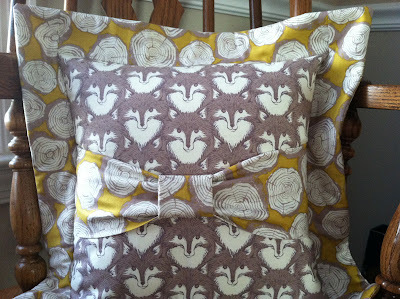 Fern and Fancy Collection by Benartex. 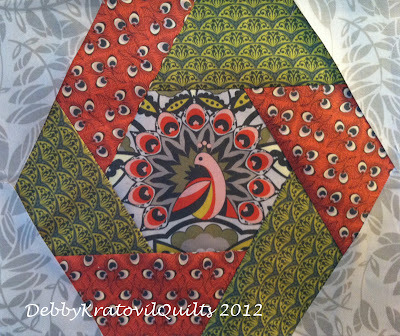 Perfect peacock motif! Is that another Half-Hexagon Quilt? Oh, Sockey! You are so cute! 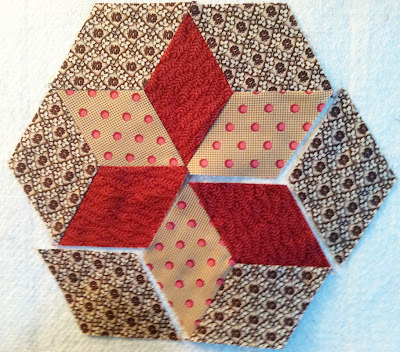 And another Twisted Hexagon. Is that Sockey? For my favorite second daughter. 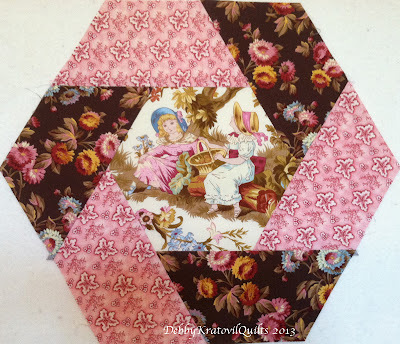 Is that a toile scene inside that Twisted Hexagon? 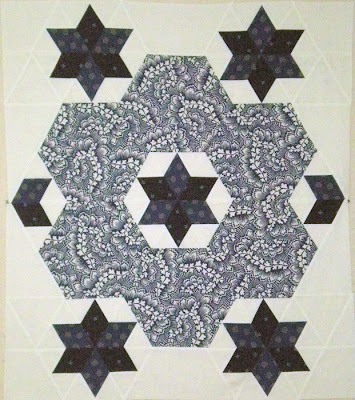 Only hexagons and triangles. No set-in seams! Very easy hexagon table runner. I've actually made two of these! 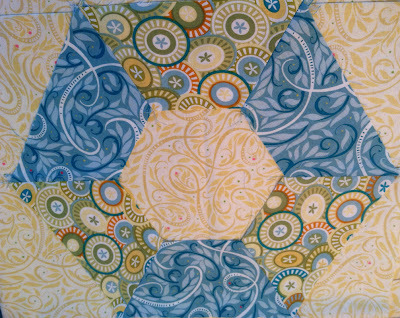 Hexagons and triangles. That's it! Hexagon Wreath - no set in seams, honest! OK. I'm exhausted. 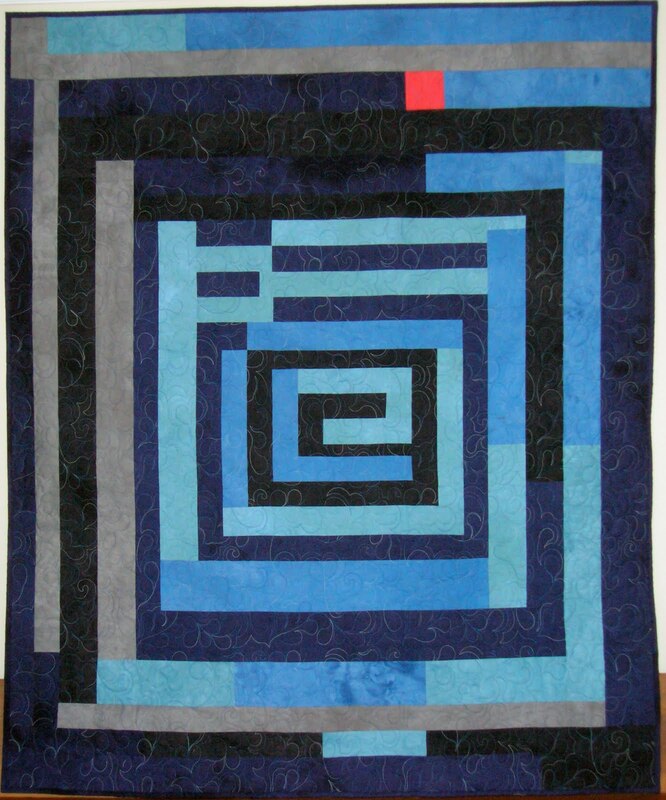 And I have SO MANY more quilts. But this is just to show you how different a 60 degree angle can look. Please remember, I DO THIS FOR A LIVING and not just a hobby. So, don't be overwhelmed. I wanted to show you the enormous possibilities. And more are coming. 'Tis the Season . . . for Watermelons!